After rehearsing and performing for three months, Winter Guard qualified for the world competition in Dayton, Ohio on April 8-10. 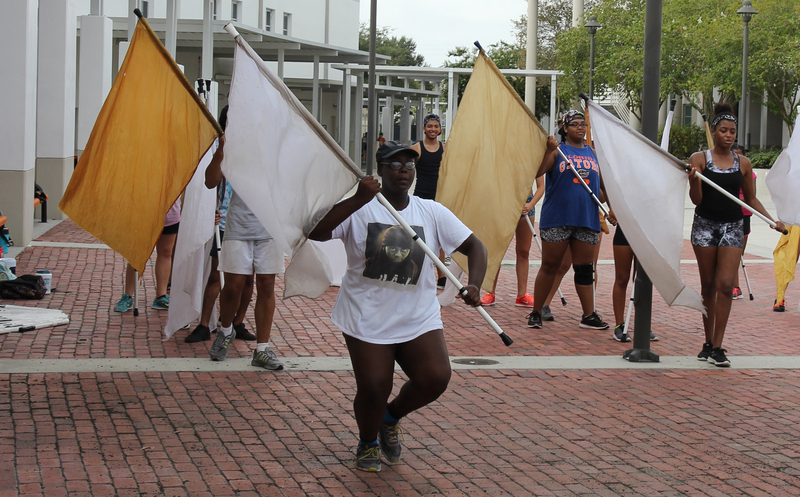 At the Florida Federation of Color Guard Circuit regional competition in Daytona Beach, Fla., junior varsity finished their season, placing fifth in the ‘Double A’ class, with a 70.30 score. Varsity qualified for the world competition, placing third in the ‘Scholastic Open’ class, with a 82.10 score. “I Pledge,” the junior varsity show portrays the idea of America without color or diversity. Each guard member wears a black and white 1950’s style outfit and hairstyles, while performing to a patriotic song and reciting the Pledge of Allegiance. 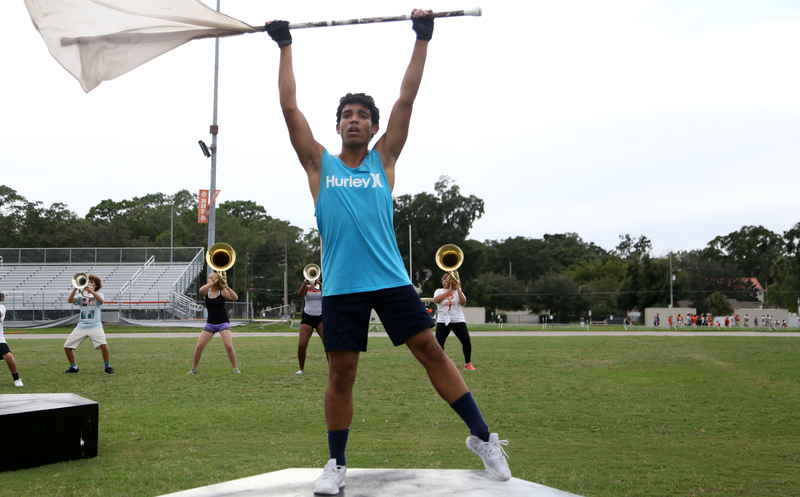 A blank flag pole stands behind the guard while they perform, symbolizing America without color or meaning. “Static” the varsity’s show includes both stretches of stagnant and fluid motions, emphasizing the drastic comparison of the two. Though the show can be be interpreted in different ways, such as being stuck in purgatory or not able to get oneself out of a situation. The guard wears black and white costumes with hints of grey, relating back to their message about the stylistic differences of two drastically separate things. The music does not have a consistent tempo or counting. All the performers watch each other to make sure they stay in sync and dance to the music. “Our show really focused on the importance of our movements and how fast or slow our bodies move. I’m really happy with how our show turned out, and the judges like it a lot since it is very different to other shows. Other shows are mostly on-beat and very strategic, but ours is very fluid and artistic,” junior Yesenia Lorenzo, varsity performer, said. On April 5-10, the varsity guard team will travel to the World Guard International Championship competing against guards from all around the globe. Placing 19th in the Scholastic Open category, the guard will perform in the preliminary competitions, hoping to advance to the final competition. Varsity will perform in the preliminary competition on Thursday, April 6. If they qualify, they will perform in the semi-final competition on April 7 and the final competition on April 8. Next articleReservation Conversation: What advice would you give to your younger self?